What happens when two super stars act together in a movie? 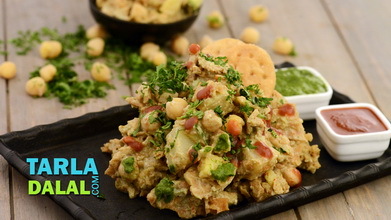 Well, the Chole Samosa Chaat creates a similar effect because both chole and samose are hot favourites with almost all Indians. 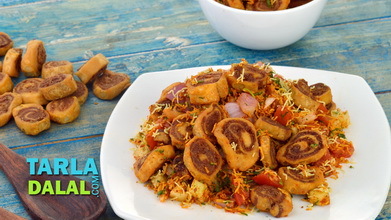 When the two are combined and topped with myriad exciting ingredients like tangy chutneys, crunchy onions and crisp sev, the resulting chaat is totally irresistible. 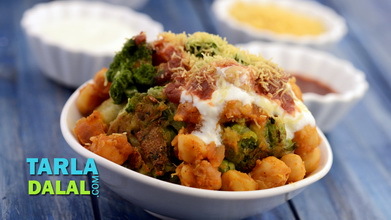 This mouth-watering Chole Samosa Chaat is an ever-popular roadside treat in Delhi, and you can find several vendors equipped with large, flat kadhais where the chole keeps simmering, ready to accompany crisp samose with snazzy toppings. 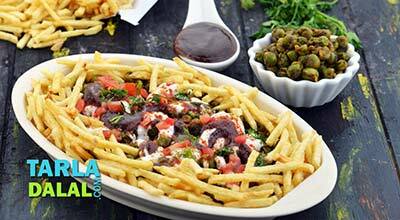 You can prepare the chole and the samose in advance, but remember to assemble the chaat just before serving. Heat the oil in a deep non-stick pan, add the garlic paste, ginger paste and sauté on a medium flame for a few seconds. Add the tomatoes, mix well and cook on a medium flame for 4 to 5 minutes or till the tomatoes turn soft and mushy, while stirring occasionally. Add the green chilli paste, chole masala, black salt, chilli powder, dried mango powder, little salt and approx. 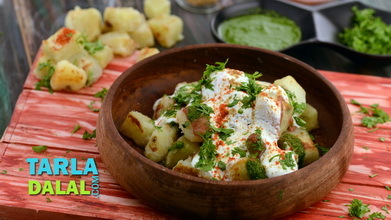 2 tbsp of water, mix well and cook on a medium flame for 1 minute, while stirring occasionally. 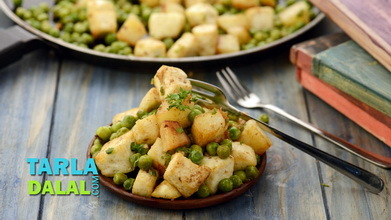 Add the chick peas and ¼ cup water, mix well and cook on a medium flame for 1 to 2 minutes while mashing it lightly using a potato masher. Divide the chole into 4 equal portions and keep aside. 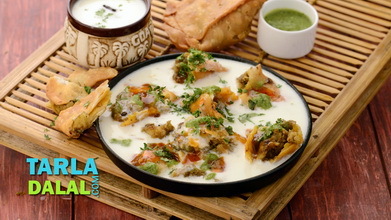 Take 1 samosa, roughly break it into small pieces and place in a bowl. 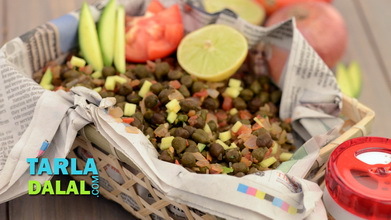 Put a portion of the prepared chole evenly over it. 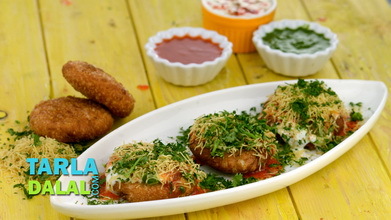 Pour 1 tbsp khajur imli ki chutney, 1½ tsp green chutney, ½ tsp red garlic chutney, 1 tbsp of onions and 1 tbsp of sev evenly over it. Finally sprinkle the coriander evenly on it. Repeat steps 1 to 4 to make 3 more plates.